A perfect marriage proposal is the best thing that can happen to any girl making her day a memorable one. This man from Tokyo did a larger-than-life wedding proposal to his 'Miss Perfect'! For his wedding proposal to just be timely right, this man required six months of travelling, Google Earth, GPS and a lot of dedication. After all the hardwork, this proposal landed him a Guinness World Record for the largest GPS drawing in history. The man identified as Yasushi “Yassan” Takahashi has an incredible story, which is now creating waves around the world. The story dates back to, 2008, when Yassan wanted to propose to his girlfriend, Natsuki. He had been creating GPS art with Google Earth and street view for over 10 years, and so he decided to incorporate that into his proposal. 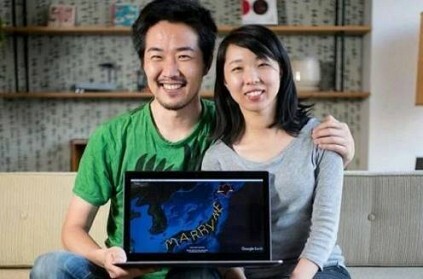 For Yassan, this form was a huge "Marry Me" spelled out across the map of Japan. According to South China Morning Post, Natsuki said "it was a big surprise to me. I felt the greatest love in the world." Below is Yassan's journey, which was tweeted by Google recently. This video has also collected a ton of impressed comments for which people are shocked and surprised. They captioned it saying, "For over 10 years, Tokyo resident Yasushi “Yassan” Takahashi has been creating GPS art with @googleearth and #StreetView—but it was his very first drawing that was his biggest, in more ways than one → http://g.co/gpsart"
சிதம்பரத்தில் '10 ஆயிரம் பேர் பங்குபெற்ற நாட்டியாஞ்சலி': கின்னஸ் சாதனை புரிந்த கலைஞர்கள்! ‘அந்த ஹேர் கட்’தான் எல்லாத்துக்கும் காரணம்.. தலைமுடியால் தலைநிமிர்ந்த பெண்! This page contains news relating to various facts and events. The views are generally about current affiars and general topics in diversified areas such as political, international, national, and regional issues, sports, health, travel, lifestyle, technology and business. People having similar interets on the above topics will find this page useful. Man's Wedding Proposal To Girlfriend Using Google Earth Landed Him A W | World News.